The new generation Bush Winch is being rolled out from 2018. It is suitable for a variety of 2WD, 4WD and AWD vehicles, and the range is continually being expanded to fit more. The Bush Winch attaches to slots in the head of the custom made wheel nuts/lugs or bolts which we supply. These permanently replace your originals and remain on your vehicle even when the Bush Winch is not being used. To select the correct Bush Winch kit for your vehicle, simply select your vehicle’s make and model from the Find My Winch page. Select the rim image that matches your vehicle’s rims and the matching Bush Winch will be listed. 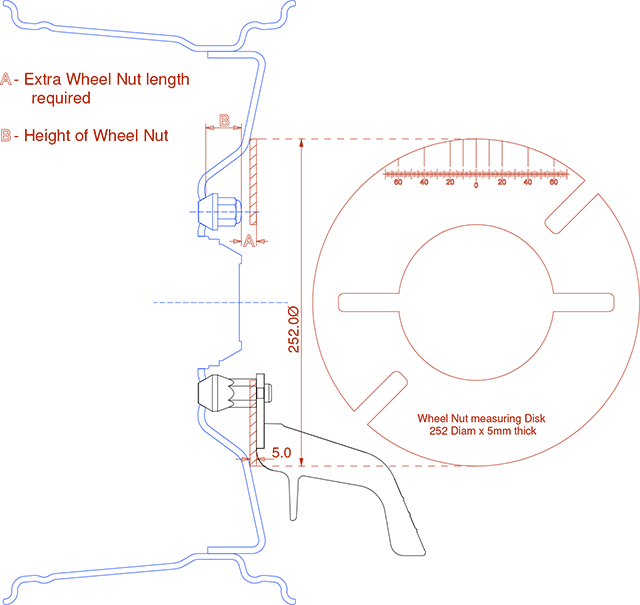 This is the number of nuts/lugs and the PCD (pitch circle diameter). For example a bolt pattern of 5×139.7 is 5 nuts and a PCD of 139.7. If you need to work out the boly pattern of you rims its easy to count the number of nuts and the diagram shows how to measure the PCD. There are may different types of threads. You will need to look up the specification for you rims to get the detail. FInally its a good idea to keep the same Hex size as your original wheel nuts so that you can use you original wheel spanner. Differnt makes and models sometimes have different hex sizes even if they have the sampe thread type. The Bush Winch nuts typically have longer heads than the original wheel nuts. This is so there is about 5mm clearence between the Bushwinch hub and the rim. The diagram shows how the winch should sit on the rim.